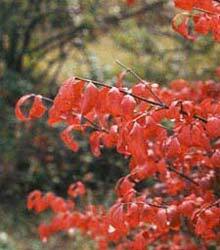 Burning bush, Euonymus alatus is a deciduous shrub that grows to 6-20 feet tall and wide. Despite its invasive nature, it is widely available in the nursery industry and wildly popular with homeowners. Burning bush is fast growing and easy to spread. Burning bush can be an attractive hedge or foundation shrub in the yard, but it will also invade a variety of natural sites including high quality woodlands, wetlands and even prairies. Once established, it forms dense thickets that displace native species and hinder natural succession. 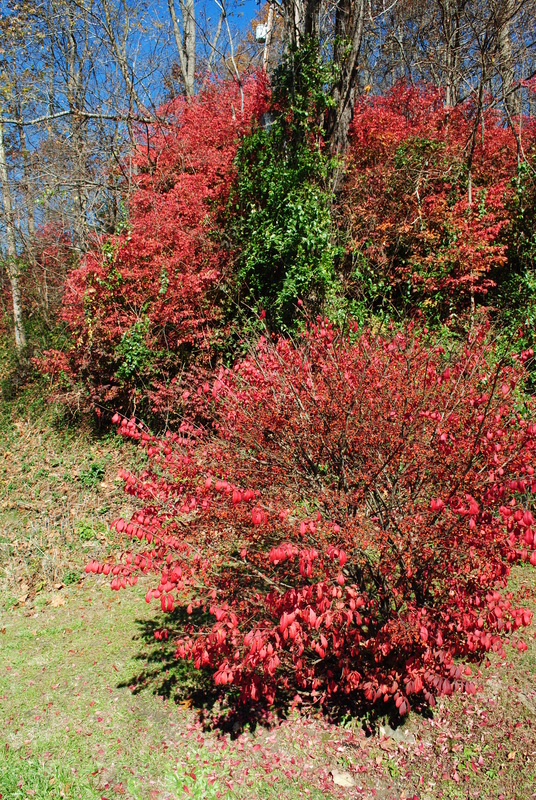 Burning bush is native to Asia and was first introduced into the US in the 1860’s for its red fall color. It continues to be sold and planted as an ornamental, even though it is considered one of the top invasive exotic species in the Midwest to avoid by most experts. It has been widely planted as an ornamental for its spectacular red autumn foliage, fruits and for its tolerance to salt. 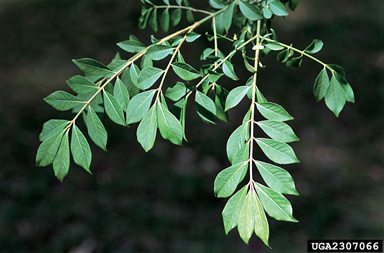 It spreads from seed, is dispersed by birds and colonizes by root suckers. It thrives in the shade where it displaces spring wildflowers and other natives. It is a very adaptable plant and can thrive in a variety of sites, wreaking havoc on a variety of native ecosystems. Seedlings and young plants can be hand-pulled when the soil is moist to insure removal of the roots system. The shallow and fibrous root systems can be removed with a spading fork and pulled with a weed wrench. On larger plants cutting alone results in thicker, more dense re-growth. Cutting should only be followed by painting the stump with a herbicide. It can be effectively controlled using any of several readily available herbicides such as glyphosate (RoundUp), tryclopyr or imazapyr. Foliar application has proven effective in controlling these species, but requires more herbicide and can have greater impacts to non-target species. By cutting the shrubs and painting just the stumps, burning bush and many other invasive exotics can be controlled using less chemicals. Always read and follow the product label and understand Federal and State requirements. 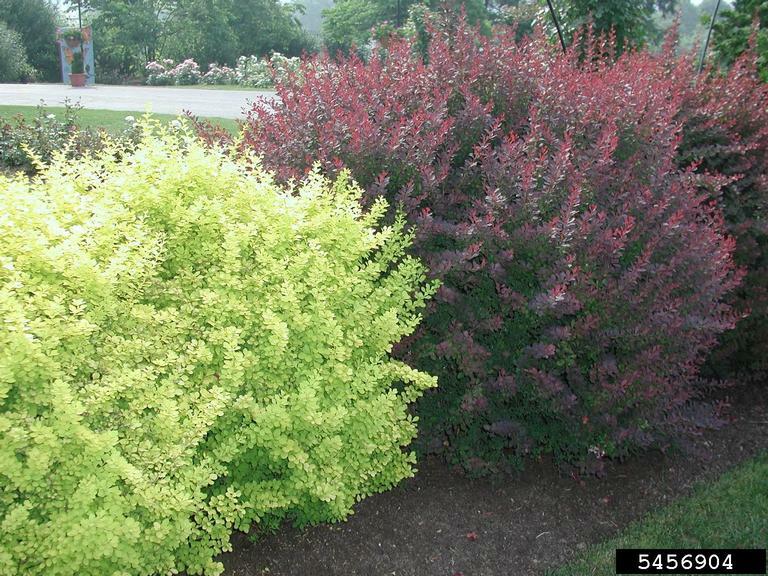 While burning bush is an attractive plant, there are many more, more attractive native shrubs. When considering planting, select native plants. Native plants are adapted to local conditions and will usually do better over time than non-native species. They also provide additional ecological benefits in addition to adding color and character to the yard. There are several native plants available in nurseries with vibrant red fall color. These include Virginia sweetspire, some viburnums, some serviceberries, black gum, Virginia creeper, hazelnut and currants. USE PESTICIDES WISELY: ALWAYS READ THE ENTIRE PESTICIDE LABEL CAREFULLY, FOLLOW ALL MIXING AND APPLICATION INSTRUCTIONS AND WEAR ALL RECOMMENDED PERSONAL PROTECTIVE GEAR AND CLOTHING. CONTACT YOUR STATE DEPARTMENT OF AGRICULTURE FOR ANY ADDITIONAL PESTICIDE USE REQUIREMENTS, RESTRICTIONS OR RECOMMENDATIONS.